“A man who does not prepare his children for his own death is not a good father,” says T’Chaka, the father of T’Challa, the prince of Wakanda who becomes the next Black Panther king in the film Black Panther. It’s an emotional moment spoken between father and son and it’s a conversation that takes place in the spirit realm – T’Chaka has died and the ritual T’Challa must complete requires him to visit his ancestors before becoming king. T’Challa is ready to be king, but as he admits, he’s not ready to let go of his father. 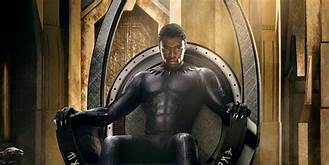 It’s one of the final lessons T’Challa must learn as he becomes king and it resonates not just throughout the film as T’Challa figures out what kind of king he wants to be and how he wants to lead his people in the twenty-first century, it also resonates throughout the audience and society in general, as we wrestle with what kind of world we actually live in – one where parents and teachers have to prepare children not for the eventual deaths of adults but for the eventual shooter who will try to claim their young lives. Indeed, as a parent sitting in the audience, I wanted nothing more than to clothe every child in the world with a Vibranium suit to stop every bullet that could ever be fired (a Kevlar suit made by Under Armour might work). Perhaps that’s the only way our gun epidemic will be solved. Maybe with the help of someone like Shuri (T’Challa’s sister who makes James Bond’s Q look like an amateur) we can come up with the right technology to make guns truly obsolete (an app that disables AR15s?). Or, if we could adopt T’Challa’s philosophy, maybe we could change enough hearts and minds to make a real difference (like the teens in Parkland, Florida are trying to do). What makes Black Panther so appealing is that it isn’t afraid to be intellectual while also being completely badass, nor does it limit itself to one debate or one villain. On one level, T’Challa wrestles with his identity (son, brother, king, super hero, savior of the world) and with his role as Black Panther, which is complicated due to the knowledge he learns about his father’s past (and the politics of Wakanda). On another level, T’Challa weighs Wakanda’s role in the world, having to decide whether his country should stay isolated (hidden from the world, like Wonder Woman’s Island of Themyscira, by an invisible, holographic shield) or should join the world, if not lead it. This is what makes Black Panther so philosophically engaging (in a way that echoes Star Trek’s debate on the Prime Directive), as T’Challa wrestles with these moral dilemmas throughout the film, especially when he’s challenged by Erik Killmonger, a man who’s actually T’Challa’s cousin who no one knew about (except Forrest Whittaker, playing a Wakandan version of Gandalf). Erik champions another option for how to utilize Wakanda’s advanced technology: use it to arm the oppressed of the world so they can rise up and defeat their oppressors. Erik wants to start the world over again by cleansing it of Colonizers – and in the framing of the film (which references the Rodney King beating and slavery while essentially dramatizing the debate between Martin Luther King, Jr. and Malcom X) it’s difficult to blame Erik for his position or his actions (especially when his very sympathetic backstory is revealed – because Erik also visits the spirit realm in a very emotional scene). The dilemma comes from each argument having some moral weight to it (both MLK and Malcolm X had valid points, as do T’Challa and Erik). T’Challa certainly feels that Wakanda’s Vibranium technology (it’s way more than just an indestructible metal) is worth using for the sake of humanity, a compassion he shows when he spares M’Baku’s life, saves Everett Ross’s life, and offers to save Erik’s life. In fact, T’Challa makes for an interesting hero, one who values not just compassion, but mercy and second chances, too – virtues he embodies throughout the film, especially when he addresses the United Nations at the end of the film and essentially reveals himself to the world (like Iron Man). Still, Erik’s argument had merit and it’s a shame T’Challa and Erik couldn’t find a way to work together (though it’s possible that could happen in Black Panther 2). Nevertheless, T’Challa was wise enough to see Erik’s perspective, which he makes clear in his decision to reveal Wakanda to the world at the UN and also during a second visit to the spirit realm where T’Challa confronts his father and all his ancestors, telling them that they were wrong to hide the truth of Wakanda (and other personal truths that factor into the story between T’Challa and T’Chaka). In fact, T’Challa follows through on Erik’s idea of arming the oppressed by buying three buildings in Oakland, California for the purpose of arming the disadvantaged local youth not with weapons but with knowledge (because Shuri is going to teach them about science and technology). It’s a fitting ending, offering a pointed commentary on what our world needs right now. After all, T’Challa has the technology to destroy the world (or enslave it) if he wanted to. Instead, he offers Wakanda’s knowledge as a panacea for all our ills, because in T’Challa’s mind, we’re all part of the same tribe. Thus, Black Panther ultimately promotes an altruistic philosophy and it’s a risk because it places Wakanda in possible danger from the outside world (because that argument has merit, too) and it really doesn’t benefit T’Challa or Wakanda at all for T’Challa to reveal Wakanda to the world and share their knowledge. As T’Challa recognizes, “If anyone found out what we truly are, what we possess […] it could destroy the world.” Or, as one Wakandan recognizes, outsiders and refugees only “bring their problems with them.” This is what makes T’Challa’s decision truly altruistic. To understand this better, let’s filter T’Challa’s actions through Thomas Nagel. To keep things somewhat terse, we’ll focus on the concept of motivation as Nagel frames it in his book The Possibility of Altruism. Initially, Nagel distinguishes between two possibilities for understanding the motives behind altruistic behavior, what Nagel refers to as internalism (which ties motivation to ethical principles) and externalism (which requires a “psychological sanction” to “motivate our compliance”). Another (admittedly simplistic) way to view this is that internalists apply a principle (thou shalt not kill) to a situation, while externalists consider the consequences (thou shalt not kill, unless …) that will result from a situation. What’s interesting for T’Challa is that he seems to do both. T’Challa’s nature is to be merciful. He’s internalized this principle to the point that it guides him instinctively. Rather than kill M’Baku, he asks him to yield. Rather than let Agent Ross die, he takes him to Wakanda and lets Shuri heal him. Rather than turn Erik away, he accepts Erik’s challenge for the throne. T’Challa also shows great compassion for Erik’s situation and, even after defeating Erik in an epic battle, T’Challa offers to use Wakanda’s technology to save Erik. After all the horrible deeds that Erik has done, T’Challa is still willing to give him another chance (and T’Challa seems genuinely disappointed that Erik refuses). Here, we can see another principle guide T’Challa – T’Challa views Erik as family, both in the immediate sense (because they’re cousins) and in the larger sense (because he sees the world as one tribe). And yet, T’Challa also considers the external circumstances and the consequences his actions produce, especially with regard to revealing Wakanda to the world. Understanding the danger this poses to the Wakandan people and to the world, T’Challa nevertheless reasons that it’s the right thing to do, especially given the situation: the outside world needs serious help and he has the ability (if not the responsibility) to provide it. So, there’s a mixture for T’Challa’s motivation to choose altruism instead of remaining isolated and egocentric. Indeed, T’Challa’s actions seem to fit the definition of altruism that Nagel gives us: “the conception of oneself as merely one person among others.” More plainly, T’Challa helps others for the sake of others, not for the sake of himself, even if it means having to disregard his own self (after all, he’s willing to die for his country, if not the world – it’s difficult to be more selfless than that). Similar to Wonder Woman, which showed Diana (mostly) making decisions out of a sense of pure selflessness, Black Panther offers a different, more evolved type of superhero than perhaps we’re used to seeing or cheering (though, to be fair, it’s easy to be selfless when you either have an indestructible Vibranium suit or you’re indestructible because you’re the daughter of Zeus). Perhaps this is what has made both of these films so globally appealing. As saturated as the superhero movie genre is (and as clichéd as it’s become) it’s telling that two of the genre’s best heroes right now are Wonder Woman and Black Panther – not because one’s a woman and the other’s an African, but because both are inherently good, which, for some reason, seems a rarity these days, especially in our real-world leaders. Of course, as T’Chaka observes to T’Challa in the spirit realm, “it’s hard for a good man to be king” (even Wonder Woman took a century off before rejoining the fray, and she’s a goddess). The takeaway is that Black Panther’s altruism ultimately envisions a world that values learning more than killing and embraces the future rather than longing for the past, equalizing all of us through mutual benefit rather than mutually assured destruction. More pointedly, in T’Challa’s world we don’t need guns (or any weapons), we need technology that makes life better for everyone – in such a world, tomorrow matters more than yesterday. It might be a utopian fantasy, but after years of dystopian nightmares, it’s a refreshing change to consider a narrative and a hero more oriented toward peace than destruction, more willing to build than destroy. Thus, for T’Challa, we don’t need to prepare our children for our deaths or theirs, we simply need to realize our potential, not as individuals, not as nations, and especially not as enemies, but rather as part of the human family we all belong to – that’s what altruism is ultimately about. Whether we’re internal or external in our motivation (or a combination), what matters is that we get motivated (like the kids in Parkland, Florida, who may end up sacrificing their innocence to save us all, as they’ve already graduated into adulthood). There’s a certain appeal to Wakanda’s purity, with a Garden of Eden innocence that seems completely out of place in our real world. As a thought experiment, it should make us wonder what kind of world we’d be living in if all the money we spend on waging war were redirected toward advancing society. What would happen to our world if we pulled our resources together to propel us into the future? Would we resemble Wakanda? Or, would we be fighting over who gets the best Vibranium-infused weapons, jewelry, medicine, cars, tech, and homes? Edwardo Pérez is an Associate Professor of English at Tarrant County College in Hurst, Texas. Black Panther. Dir. Ryan Coogler. Perf. Chadwick Boseman, Michael B. Jordan, Lupita Nyong’o. Walt Disney Studios, 2018. Nagel, Thomas. The Possibility of Altruism. Princeton University Press, 1970. ← What Even Matters Anymore?